No staff members to tell people off from noise at late hours causing lack of sleep. Great pool and parking, easy access to M1 Pool area and related amenities are still great after a refurb 3yrs ago, have stayed twice with no real issues. Apartment was comfortable with great beach views and recent kitchen. 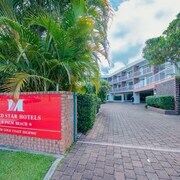 The motel is dated in some aspects hence price. Beautiful view and clean apartment. Was very easy at check in. Perfect Weekend The managers were very helpful and the location perfect for our getaway. Apartments were well furnished and the little things like fixtures and kitchen stuff were of a high standard. Will definitely head there again and enjoy a sunrise over the ocean. Great Views Nice place, could do with a slight facelift in areas, steam room didn't work. But being a little picky as the hotel was nice, staff on reception very friendly and a great view of the ocean, could have stayed longer. If humans were meant to stay in one place, we'd have roots instead of feet — so make like a tree and leave to Palm Beach! 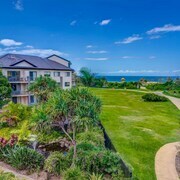 11 kilometres from the heart of Gold Coast, you'll find a hotel to suit your style, whether you're keen to splash some cash or keep things low-key. If you love checking off bucket-list attractions, Gold Coast will treat you good. A day out at Sea World, Dreamworld and Warner Bros. Movie World will give you major travel bragging rights. On a lazy afternoon, there's nothing finer than having a rest in Palm Beach Pirate Treasure Island Playground. 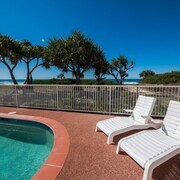 If you're eager to set yourself up nearby, a couple of fabulous options are the Sanctuary Beach Resort and Little Cove Currumbin. Take your mates on a sprightly hike through nature at Burleigh Head National Park. 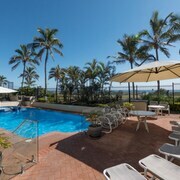 The hotels to check out near here are the Burleigh Surf Apartments and Gemini Court Holiday Apartments. 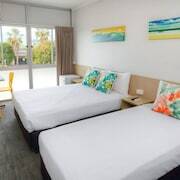 Instead of counting fluffy sheep, you'll find yourself counting all the cash you've saved when you take a room at the Palm Beach Hotel and Tallebudgera Creek Tourist Park. Make sure you get in quickly though. 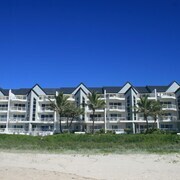 While there's a nice selection of budget accommodations in Palm Beach, the best deals get claimed fast! You certainly don't need soft, fluffy bathrobes, an enticing room service menu and 1000 thread count sheets all of the time (that said, it's nice to splash out every now and then, right?). 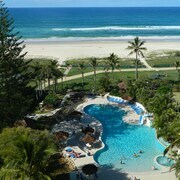 The more deluxe options here include the Royal Palm Resort and Surfers Horizons Resort. 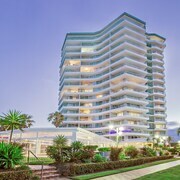 If you and your BFFs can't seem to snag the right Palm Beach hotel, you may want to check out the accommodations in Elanora and Burleigh Heads. In a few clicks you can log off and start packing your bag for an unforgettable Palm Beach getaway. From flights to hotels, we'll help you every step of the way — just say the word!